Plot: A Mummy hunts those who desecrated the tomb of his Pharaoh. “The Mummy’s Shroud” is…every mummy movie ever made…I suppose there are some deviations from the classic formula, such as the Mummy targeting those who entered his Master’s tomb (instead of his own) and I was appreciative that they didn’t recycle the reincarnation subplot that has become so prominent within the Mummy franchise. But for the most part, “The Mummy’s Shroud” tells the same story in the exact same way as all of its predecessors. This is actually the third entry in the Hammer Mummy franchise, which began with “The Mummy (1959)” (sometimes called “Terror of the Mummy“) and continued with “Curse of the Mummy’s Tomb“. The first two films both borrowed extensively from “The Mummy’s Hand” (NOT the Karloff classic, contrary to popular belief), but at least they tried developing their own cinematic personalities. “The Mummy” is actually pretty damn good, providing one of the scarier incarnations of the titular character, updating the design and making him faster and more intense. “Curse of the Mummy’s Tomb” wasn’t worth much, but for all of its misguided and often horrible attempts at drama and mystery, at least it had some ambition. I believe the filmmakers were trying to add to the formula and do their own thing, while paying respect to the films which inspired it. For me, it back-fired and made the movie somewhat obnoxious, which might be why I personally preferred “The Mummy’s Shroud“. It’s significantly blander than “Curse of the Mummy’s Tomb“, but it also doesn’t burden its narrative with tepid romances or attempts at misdirection. It’s relatively easy to watch, even if very little stands out. The first 10 minutes set up the story using flash-back footage, shots of paintings and a voice over (who sounds like Peter Cushing). I was taken aback by the length of time needed to establish all of this and in retrospect, most of it wasn’t necessary. It shows us how the Mummy has a tragic history, but nothing is ever done with this idea. 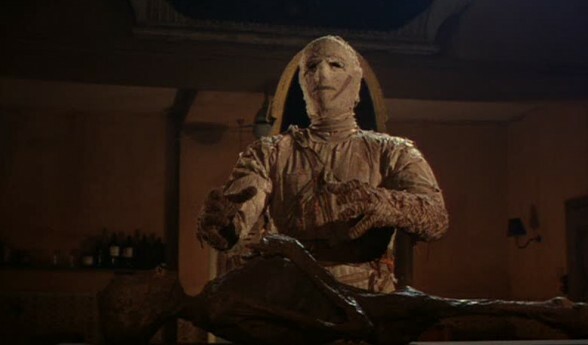 The Mummy from “The Mummy’s Shroud” is just a shambling monster with no personality or characterization. So why did we need to learn about the Pharaoh’s wife dying or his treacherous brother plotting a coup, when these plot points never come up again? All that was required is “Prim (The eventual Mummy) was deeply loyal to the exiled Prince“. The first 45 minutes aren’t boring, but they contain very little relevant material. André Morell‘s character is bitten by a snake and becomes increasingly unhinged, even to the point of being sent to a mental institution. We learn that he was sent there under false pretenses, but the problem is…he acts kind of crazy, although I’m not sure why. Did he have some sort of premonition? Are dark forces at play? Was it just snake venom? So much of the film is dedicated to this storyline, only for it to abruptly end and reveal itself as nothing more than filler. Other subplots, such as Paul (David Buck) feuding with his Father (John Phillips) or Claire (Maggie Kimberly) having Precognitive abilities are also there, but seemingly for no reason. Yet I have to admit that I wasn’t bored, probably because every scene presents itself as important, even when it’s not. How was I suppose to know that there wouldn’t be any pay-offs to these storythreads? While they were happening, I was kind of interested. I attribute this to the actors, who even though they might be portraying living plot devices instead of characters, at least invested themselves in the material. I wouldn’t describe any of their performances as phoned in, even if some of them have very little to do. The second half is dedicated to the Mummy attacks, which are surprisingly grisly. My favorite scene in the entire movie is when the Mummy battles the photographer (Tim Barrett), primarily because it’s interesting seeing a victim fight back and the battle was a nicely choreographed and framed. The director also shows flashes of style, drenching certain scenes in eerie, colorful lighting or providing a really cool shot here and there. There are some suspenseful moments, although much of it is undermined by the hokey Mummy costume. The bandages don’t look very convincing and the actor lacks the intense body language of Christopher Lee, opting to do normal (cliched) Mummy mannerisms instead. Furthermore, these scenes tend to be a little redundant, as each attack is built up the same way. Yet what took me out of the picture the most was the apparent apathy of the characters. All of the victims have strong relations to each-other, whether it’s familial, hero worship, romantic interest or friendship and yet…barely any time is given to their reactions towards the deaths. I found myself despising the Mother (Elizabeth Sellars), simply because she seemed indifferent to the peril at hand, just because she herself never entered the tomb. I understand that she doesn’t seem particularly fond of her husband, but what about her son? The only character whom I was invested in was the greedy, assholish millionaire Father (John Phillips), simply because he is the only one to do any real emoting in response to the deaths. The funny thing is that he’s purely self centered, only expressing distress because he knows how much danger he is in. But at least attention is given to his reactions. He’s also surprisingly pro-active in his goals, whereas the leading couple don’t really do anything until the very end. I also didn’t like the Inspector (Richard Warner), simply because he’s written to be an idiot, while we’re supposed to believe that he’s competent. When 2 members of a relatively small party are brutally butchered in a short period of time, you don’t think that there is a connection? At the absolute least, you’d expect him to assign guards to the remainder of the cast. I did like Longbarrow (Michael Ripper), who is just so pitiful that it’s hard not to feel for the guy during the later portions of the movie- especially when he is confronted by the Mummy. As for the human villains, they’re over-the-top enough to be entertaining, but they’re just caricatures. Previous (and subsequent) Mummy films have had more layered villains in these roles. Even if the actors make them work well enough, none of the characters are particularly fleshed out or developed. Nevertheless, I found the supporting cast more interesting than the primary protagonists. They’re all ‘types’, which only draws more attention to the blandness of our hero and heroine. I guess it’s kind of cool that most of the action takes place in Egypt, considering many of these movies prefer bringing the Mummy back to London. The sets are rather phony looking, but there is a nice exotic flavor to them. Most scenes take place in-doors and even the exteriors are oddly claustrophobic. I’m not sure if that’s a good thing or a bad thing, but at least the set design is decent. The direction is inconsistent, ranging from stylish (as I already mentioned) to strangely telegraphed. Sometimes the scares induce eye rolling, because they look very rehearsed. “The Mummy’s Shroud” has aged rather awkwardly in some areas, primarily casting white people in Egyptian roles using shoddy makeup, but this is something that plagued most Mummy movies for the time. I did like the music, with the main theme being very catchy and also fitting the tone. The Mummy himself might not look very good, but the special effects involved in his death sequence were fantastic. The visual was stunning and the Mummy’s reaction to its final fate added to the drama. “The Mummy’s Shroud” might have little interest in doing anything fresh or new, but it is mostly competently made, boasting good actors and decent violence. Honestly, I want to give “The Mummy’s Shroud” a passing grade because it omits the crap that I’ve disliked about most of these films- shallow, superfluous romances. I don’t even remember if they say that the main couple is a…well, couple! But even if in retrospect, most of this movie is filler, it didn’t feel like filler as I was watching it. I wasn’t enthralled, but I wasn’t falling asleep or itching to do something else. It’s just another mummy movie with very little that stands out, both for better and for worse. I’m giving it the same rating as “Curse of the Mummy’s Tomb” because I believe this was more entertaining, while its predecessor tried a lot harder to be unique. But neither film is thrilling and Hammer would only produce one more Mummy movie: “Blood from the Mummy’s Tomb“. I haven’t seen it, but I hear it’s an improvement over the other sequels. Violence: Maybe PG-13 worthy. Most of the violence is brutal, but implied. Overall: “The Mummy’s Shroud” is just another Mummy movie, only really worth watching if you’re a Hammer completist.